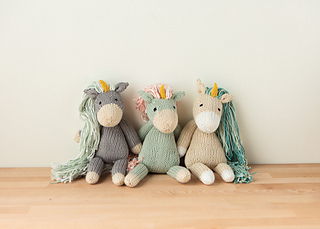 Nilla the Unicorn is the first pattern in the Yarnigans Fantasy Forest series. 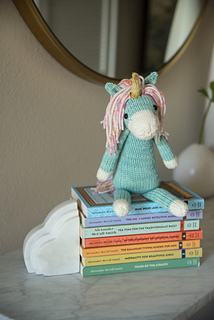 She’s 14” tall and knitted in a rather loose gauge for a toy, so she’s quite floppy and soft. She is worked in the round, and the pattern includes a detailed photo tutorial for working up and attaching her mane and tail. This pattern requires a knowledge of knitting in the round, as well as basic increases and decreases. 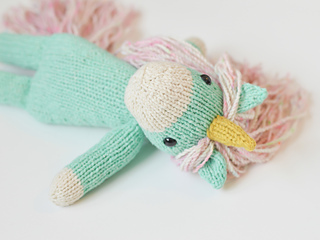 A solid color unicorn uses approximately 92 yards of the MC and 18 yds of the CC (not including any strands used for the mane).